Even if recycling was expensive and unprofitable in the past, it will not be that in the future. We need to stop landfilling valuable materials for the sake of our business and for the sake of the globe. A huge, global transformation in waste management has already begun. The biggest driver of change is related legislation that makes us shift towards recycling and material recovery. The pace varies in different parts of the world, but the direction is the same no matter where you look. On a global scale, more than half of all waste still ends up in landfills. Economic incentives are not likely to change that any time soon as waste management methods other than recycling are so much cheaper in the short term, yet lacking the channels to turn recycled waste into profit. In the long term, I see a huge growth for the new markets, where homogenous, clean and high-quality recycled particles form a valuable market. This is not only a question of business or politics, but also of our responsibility to take care of the wellbeing of the globe. The cold fact is that rare materials, for example, are to be drained if the attitudes do not change. Attitudes and the political will are changing but very slowly in many places. Landfilling is still the predominant waste management method in the United States, for example, because it is so cheap. However, establishing new landfill sites is extremely difficult, which means that waste is often transported hundreds or thousands of miles to the existing landfills. There is no point in trying to convince business owners to recycle, if there is no attractive option offered! Circular economy is one. Developing recycling and material recovery methods on a landfill is already and continues to be a good business – one that will slowly change the whole value chain. 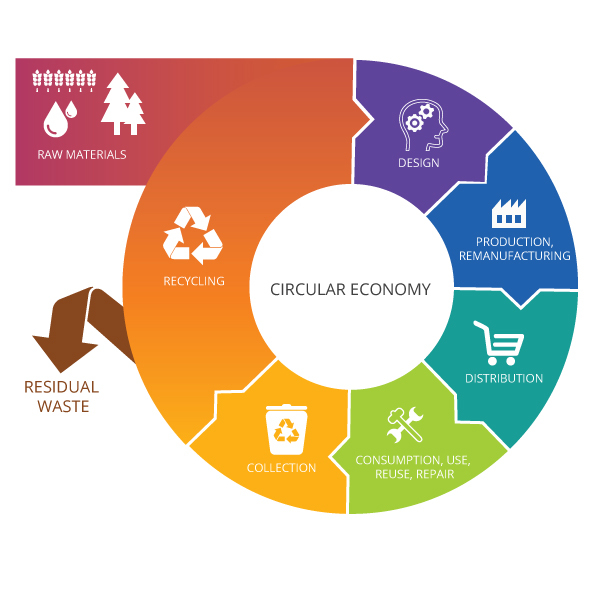 Industrialized areas like the United States, European Union and Australia will benefit the most of reusing ‘traditional’ waste types like plastics, construction waste, tires and mattresses. At the moment, Asia, Africa and India have a great problem with organic waste. In these countries, eyes have already opened and new biogas plants have already been built. I predict that soon we are seeing the growth of investments in this sector. So, what to do now? What I would recommend for all business owners, is to carefully check their own attitudes and to learn about new business opportunities that will rise in the field of recycling. There might be a diamond waiting for you. Our customer in Belgium is benefiting from circular economy.